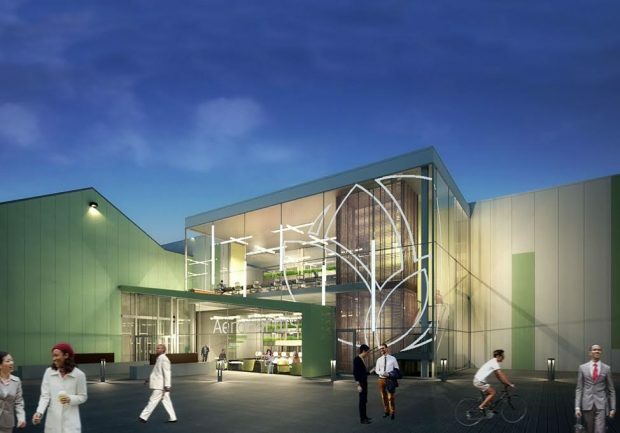 A vacant warehouse in Newark’s Ironbound district has received new life as a vertical farm. 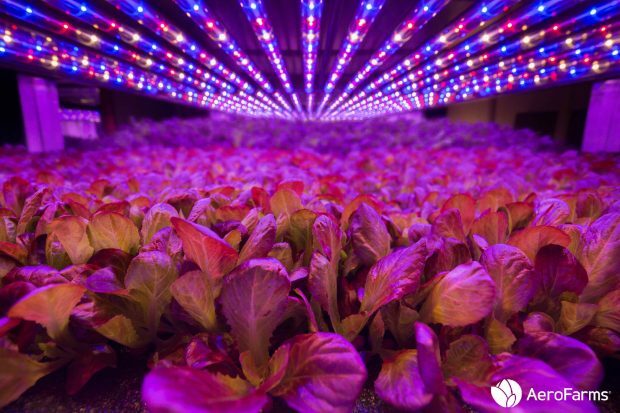 Where once steel was manufactured, there are now shelves of leafy green vegetables flourishing under LED lights. 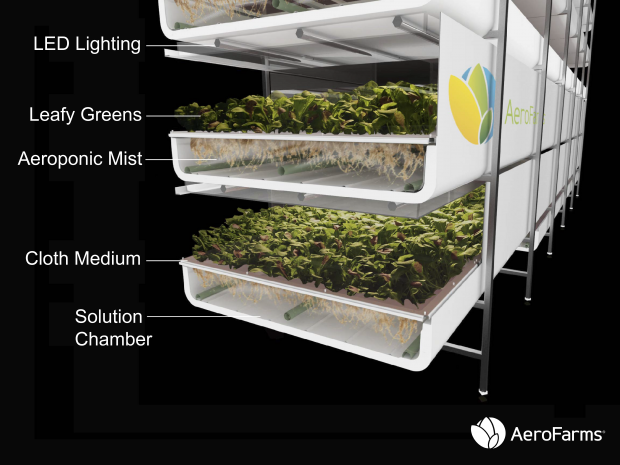 AeroFarms uses innovative farming technology to grow local produce without sunlight. 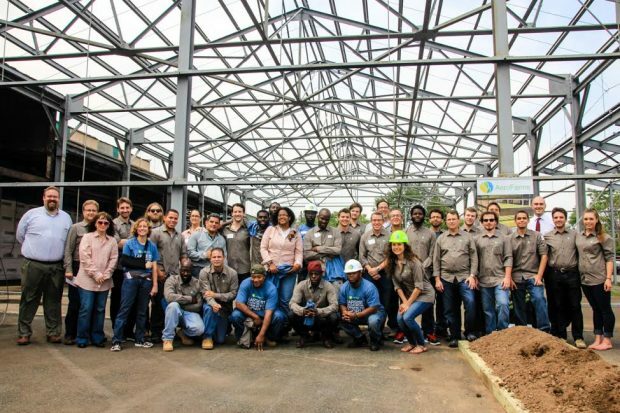 In the process, it has bolstered the economy, advanced sustainable business practices, and become an integral part of its surrounding community. 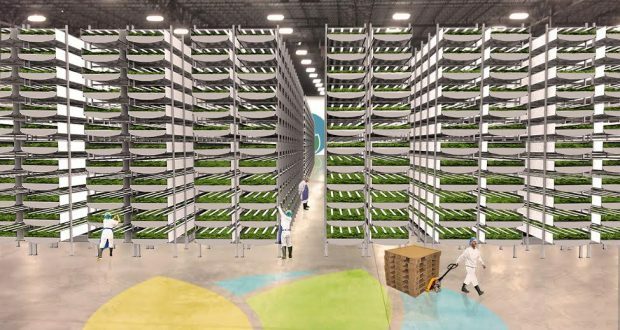 AeroFarms’ most striking feature is its broad trays of vegetables, stacked on floor-to-ceiling shelves. The plants are grown from seed in a reusable fabric. This aeroponic method requires no soil and very little water. The plants’ roots are misted with a nutrient-rich solution, and LED lights replace the sun. 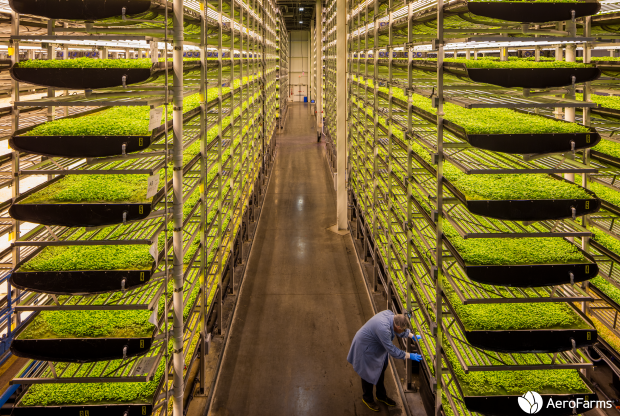 Under closely monitored and fine-tuned conditions, the plants mature rapidly and with high yield, resulting in 1.7 million pounds of greens per year. But AeroFarms stands for more than just impressive technology. The organization defines itself as a champion of the environment. As a certified B corporation, member of the Ellen MacArthur Circular Economy 100, and strategic partner for the 100 Resilient Cities initiative, it values sustainable, socially responsible business practices. 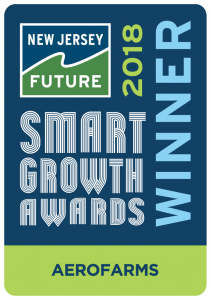 The AeroFarms building complies with New Jersey Economic Development Authority’s green building standards for energy and water efficiency, air quality, and waste management. Green infrastructure on the property helps manage stormwater on-site. 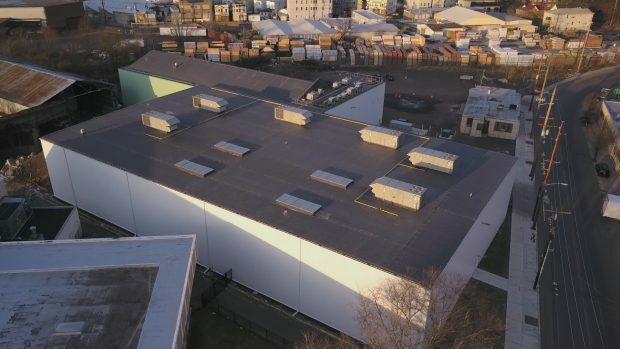 AeroFarms’ technology requires 95 percent less water consumption than a standard farm, and the facility recycles all water and nutrients in a closed loop. Indoor farming requires less fertilizer and no pesticides, and it produces no runoff. And in an era of climate risk, it provides food security by growing produce regardless of weather patterns and severe storms. To reduce its carbon emissions, AeroFarms intentionally locates its farms near distribution routes and intended markets. This reduces the need for trucking and distribution across long distances. The organization has invested in natural gas turbines, with the aim of eventually generating clean energy independent of the grid. 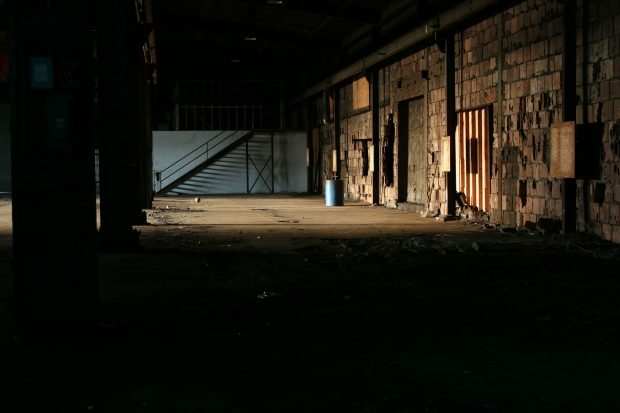 For now, its 24/7 LED lights rely on the local power grid, which PSEG and the City of Newark expanded to meet its needs. AeroFarms collaborates with the Ironbound Community Corporation to recruit local workers for its year-round, fair-wage jobs. Ironbound provides initial training on skills such as forklift operation, creating a pipeline of local talent for AeroFarms. The company has also worked with the New Jersey Reentry Program and the Newark Mayor’s Office unemployment reduction initiative, “Hire. Buy. 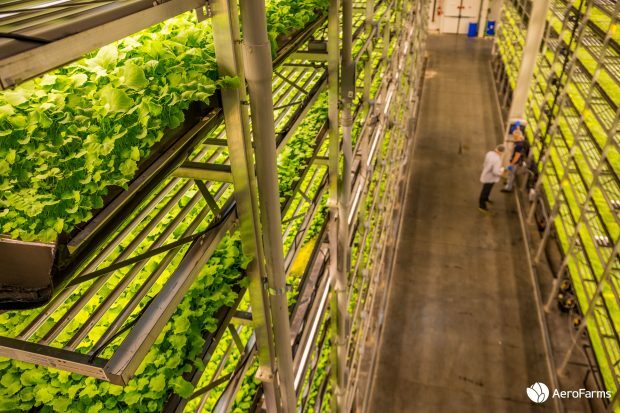 Live.” More than 40 percent of AeroFarms’ team members live in Newark, and 85 percent live within 15 miles of the city. AeroFarms also participates in local educational efforts to promote healthy eating. At Philip’s Academy Charter School, it has a small unit where elementary school students grow their own food. This hands-on experience teaches students a lifelong lesson about how food is produced and why the process matters. In an urban food desert, AeroFarms provides much-needed fresh, local produce at affordable prices. 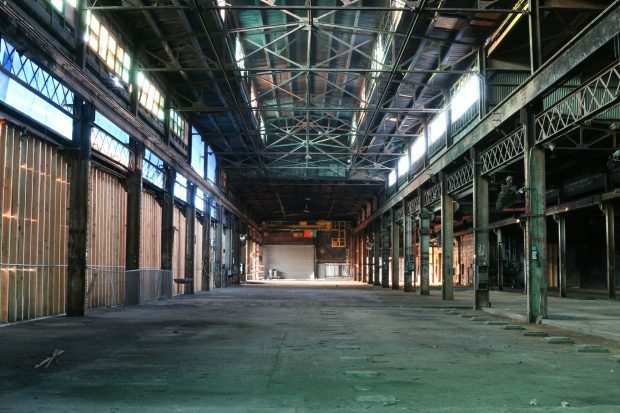 And as an anchor tenant of RBH Group’s Makers Village, the organization plans to have a positive and lasting impact on Newark’s resiliency.